DESTINATION: Koh Trong community, Kratie province, Kingdom of Cambodia. - TOUR LENGHT: half day tour (3 hours). - START TIME:8:30am or 2:30pm from Kratie Town. - END TIME:11:30am or 5:30pm at Kratie Town. Koh Trong is an island located in the Middle of the Mekong River in Kratie Province. It takes 15 minutes by sharing a wooden boat with local people to get there. As an island close to the town, Koh Trong is a great place for visitors. It has its origin beauty as a rural of Cambodia but also a nice view of the Mekong and big sand bar (dry season) where visitor can swim. A visitor would enjoy a bicycle tour in the island to see its specialty such as a Vietnamese floating village, taste grapefruit, visit local pagoda, grow trees and a wonderful meal served by the home stay owner. At 8:30AM / 2:30 PM meet your local English speaking guide at the appointed place. He will introduce himself and tour schedule of the day to you. Next, an English guide was recruited from a local student who starved to promote his province and improve his English speaking skill will discover information on a small beautiful town of Kratie. Especially, history of the town and architecture buildings reserve since the French colonies in Cambodia. Around 20 minutes after, you and your local guide set out to a shared wooden boat ride across the Mekong River from the Town to a small tiny island with the population of around 348 families called Koh Trong Island. In the next 15 minutes after the boat ride, you may step your first step on this island. In the dry season, the Mekong low down it’s water level as a result a big sand bar appears from the village of Koh Trong to the river, this is where you will need to spend some time walking across. You will not see the sand bar in raining season as it is under the water. In the village center, everyone will be gathered and received information on the island by your local English guide. Then jump on a local push bicycle follow your English guide and the community facilitator to do a round bicycle tour of this village. You will pass many friendly local families and kids. Furthermore, you will see a charming rural life as an island in the middle of the Mekong. Besides, these attractive visuals you will be brought by the local English guide to see interesting Vietnamese floating villages which all of their houses were from wood and bamboo. The history of present of these Vietnamese will also be raised to the group. Additionally, you will go pass a local grapefruit plantation. Grapefruit is a famous symbol of KohTrong Island because only Koh Trong can grow this kind of tasty grapefruit. After that, you will be leaded by a guide to grow trees in the community. This reforestation project has started by the community because they want to improve air quality in their village and do the environment contribution. Next you will pass by a local pagoda where you will get the head off the road to visit. Belief of local people, the role of the religion in the village and pagoda procedure will be explained by your local English guide. This is the last part of your tour today village. Lastly, we head back to the town by the same boat and this is the end of the tour. 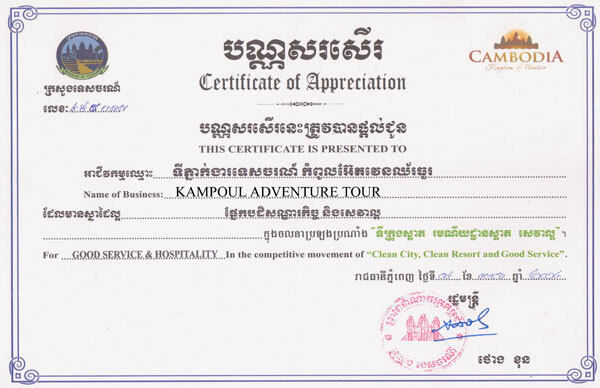 DESTINATION: Kampi Dolphin Pool, Kratie Province, Kingdom of Cambodia. - TOUR LENGHT: Half Day (2 hours and half). - START TIME: 8:30 AM / 2:30PM from Kratie Town. - END TIME:11:00 AM / 5:00 PM at Kratie Town. Kampi Dolphin Pool situated around 14 km from Kratie Town. It is a big pool among nine dolphin pools in the Mekong River from Kratie to Laos’s border. The Mekong River Irrawaddy dolphin is an amazing creature. They were found the most in Cambodia while there were some more in Thailand, Laos and Philippine. In Kratie, the Mekong fresh water dolphin is a key attraction / symbol of every visitor. Unlike sea dolphin, Mekong River dolphin has its uniqueness in catching fish and living life. They were chosen to protect by international and local conservationist because they are endangered. Moreover, the trip to see the dolphin will enable visitor to visit two other cultural places. First, Thma Krae village is an original village of making sticky rice in the bamboo while second Sombok Mountain that has a pagoda on it. At 8:30AM / 2:30 PM meet local English speaking guide at the appointed place. He will introduce himself and tour schedule of the day to you. Next, an English guide was recruited from a local student who starved to promote his province and improve his English speaking skill will discover information on a small beautiful town of Kratie. Especially,history of the town and architecture buildings reserve since the French colonies in Cambodia. Next, everyone gets on a local Remorque Khmer (Tuk Tuk) leaving the agenda of Thma Krae village. The ThmaKrae village is a village famous in making roast sticky rice in the bamboo “called Kralan in Khmer. Kralan has become food symbol for Kratie Province long time ago while its company is crush fish in the banana leaf “called Nhem in Khmer”. Your guide will introduce you to know how they were made and how it helps the local people here. Moreover, you will be able to taste these as well. After visiting Thma Krae village, Sambok Moutain (a mountain of a hill) will be our destination before the dolphin pool. This old age quiet pagoda was known as the great place for people who are seeking for a peaceful environment and meditation. Your local English guide will guide you to see a last long beautiful painting and its meaning and other visual around the pagoda. Least but not last, you will be brought to the Kampi Dolphin pool. It is a biggest dolphin pool in the Mekong River where tourist can view the dolphin all year long. The Mekong Irrawaddy dolphin is an endangered species. There are many conservation NGOs working to conserve them. After 10 minutes of the presentation by your local English guide about the dolphin biography. You will embark on the wooden boat, driven by an expert local people who benefit from the dolphin conservation project. The boat man will float the boat nearby the pool for about 1 hour for you to spot the dolphin or take a good picture of them. Next, your guide will bring you to do shopping or window shopping at many small thatch shops shape of a line are selling small and big dolphin statues made of wood. This is a handicraft of the local people in this village. Travel back to the town by Remorque Khmer (TukTuk). You will be recommended by your local guide a good place to spot the sun set (dry season). End of the tour. DESTINATION: 100 pillars pagoda, Sambou district, Kratie Province. Wat Sarsar Mouy Roy (100 pillars pagoda) is located around 36km from Kratie Town. This pagoda is a famous pagoda for local people and tourist. This beautiful Wat Sarsar Mouy Roy has an interesting history, interesting legend and actually has between 108-116 pillars depending on who you ask! The visitor will see a very beautiful painting of the Buddha life story, the big Buddha statue and the way local people respect Buddhism. Moreover, visitors can also see the turtle conservation center which establishes for the Mekong turtle conservation by Conservation International. The Mekong turtle are endangered. The trip to Wat Sarsar Mouy Roy also enables to get off the road to visit some of the places along the way such as Sambok Moutain and Kampi Dolphin Pool as well. At 9:00AM meet your local English speaking guide at the appointed place. He/She will introduce himself and tour schedule of the day to you. Next, an English guide was recruited from a local student who starved to promote his province and improve his English speaking skill will discover information on a small beautiful town of Kratie. Especially, history of the town and architecture buildings reserve since the French colonies in Cambodia. Next, everyone gets on a local Remorque Khmer (Tuk Tuk) departure for the agenda of Thma Krae village. Thma Krae village is a village famous in making roast sticky rice in the bamboo “called Kralan in Khmer. Kralan has become a good symbol for Kratie Province long time ago while its company is crush fish in the banana leaf “called Nhem in Khmer”. Your guide will introduce you to know how they were made and how it helps the local people here. Moreover, you will be able to taste these as well. After visiting Thma Krae village, Sambok Moutain (a mountain of a hill) will be your destination before the dolphin pool. This old age quiet pagoda was known as the great place for people who are seeking for peaceful environment enjoyment and meditation. Your local English guide will guide you to see a last long beautiful painting and its meaning and also visual around the pagoda. Least but not last, you will be brought to the Kampi Dolphin pool. Kampi is a biggest dolphin pool in the Mekong River where tourist can view the dolphin all year long. The Mekong Irrawaddy dolphin is an endangered species. There are many conservation NGOs are working to conserve them. After 10 minutes of the presentation by your local English guide about the dolphin biography. You will embark on the wooden boat, driven by an expert local people who benefit from the dolphin conservation project. The boat man will float the boat nearby the pool for about 1 hour for you to spot the dolphin or take a good picture of them. Next, your guide will bring you to do shopping or window shopping at many small thatch shope shapes in a line are selling small and big dolphin statues made of wood. This is a handicraft of the local people in this village. Regarding to the next agenda, you will go to Sambou district where you will spot 100 pillars pagoda and turtle conservation center. 100 pillars pagoda is also called Wat Sasar Mouy Roy in Khmer, it is most popular pagoda in this province. Wat Sasar Mouy Roy also has its interesting history around the 13th century and during the pol pot regime. Unlike the other pagodas in Kratie province, 100 pillar pagoda has its own uniqueness. Inside the pagoda, there is a turtle conservation center. The center has established to conserve the Mekong Turtle as it is endangered. Have a short break after visiting the pagoda in a small drink shop in front of it at the riverside where you can see a few islands and sand bar in dry season, there are sugar can and coconut juice await you. When drinking time is over you will get back on your Remorque Khmer head back to the town of Kratie. End of the tour. DESTINATION: KohPhdao Community, Samboudistrict, Kratie Province. KohPhdaois a village situated in the biggest island along the Mekong River. It is around 45km from Kratie Town. KohPhdao is a great place for visitors. KohPhdao has natural delights, rare creatures, local culture and authentic lifestyles collide to form shapes previously unimagined. The visitor can also enjoy the peace full life, tranquility and natural beauty of rural island life or an opportunity to immerse yourself completely in village life. Moreover, bicycle tour to see the other villages around was also popular for every visitor who had been to KohPhdao before. The tour to KohPhdao will also enable visitors to see the places along the way for it to such as a Thomas Krae village, KohPhdao/Kampi dolphin pool, WatSarsarMouy Roy and the turtle conservation center. At 8:00AM meet your local English speaking guide at the appointed place. He/She will introduce himself and tour schedule of the day to you. Next, an English guide was recruited from a local student who starved to promote his province and improve his English speaking skill will discover information on a small beautiful town of Kratie. Especially, history of the town and architecture buildings reserve since the French colonies in Cambodia. Next, everyone gets on a local Remorque Khmer (TukTuk) departure for the agenda of ThmaKrae village. The ThmaKrae village is a village famous in making roast sticky rice in the bamboo “called Kralan in Khmer. Kralan has become a food symbol for KratieProvince long time ago while its company is crush fish in the banana leaf “called Nhem in Khmer”. Your guide will introduce you to know how they were made and how it helps the local people here. Moreover, you will be able to taste these as well. After visiting ThmaKrae village, SambokMoutain (a mountain of a hill) will be our destination before the dolphin pool. This old age quiet pagoda was known as the great place for a person who is seeking for peaceful environment enjoyment and meditation. Your local English guide will guide you to see a last long beautiful painting and its meaning and also visual around the pagoda. Least but not last, you will be brought to the Kampi Dolphin pool. Kampi is a biggest dolphin pool in the Mekong River where tourist can view the dolphin all year long. The Mekong Irrawaddy dolphin is an endangered species. There are many conservation NGOs are working to conserve them. After 10 minutes of the presentation by your local English guide about the dolphin biography. You will embark on the wooden boat, driven by an expert local people who benefit from the dolphin conservation project. The boat man will float the boat nearby the pool for about 1 hour for you to spot the dolphin or take a good picture of them. Next, your guide will bring you to do shopping or window shopping at many small thatch shops shape of a line are selling small and big dolphin statues made of wood. This is a handicraft of the local people in this village. Regarding to the next agenda, you will go to Sambou district where you will spot 100 pillars pagoda and turtle conservation center. 100 pillars pagoda is also called WatSasarMouy Roy in Khmer, it is most popular pagoda in this province. WhatSasarMouy Roy also has its interesting history around the 13th century and during the pol pot regime. Unlike the other pagodas in Kratie province, 100 pillarpagoda has its own uniqueness. Inside the pagoda, there is a turtle conservation center. The center has established to conserve the Mekong Turtle as it is endangered. Have a short break after visiting the pagoda in a small drink shop in front of it at the riverside where you can see a few islands and sand bar in dry season, there are sugar can and coconut juice await you. Instead of going back to the town, your local English guide and you will jump on a slow local wooden boat from KohPhdao await to take you to the KohPhdao village. Boat riding is going to take you sometimes but also give you a chance to see how village life along the river. In KohPhdao, you will leaded by the community to see their village, visit friendly families, see spirit house of local people which they believe the spirit brings them happiness and understand the development activity of Cambodian Rural Development Team Organization this village. Today you will experience local food that cooked by a group of local women. Moreover, your night time will spend inside the honesty of the local family in a room divided by a curtain, just as local. Pillows, a mosquito net and a blanket prepare for your sleeping night. Next day morning, after breakfast, everyone gets on the same boat back to the mainland and getrid on the taxi / minivan back to Kratie town. End of the tour. DESTINATION: Koh Phdao Community, Sambou district, Kratie Province. Koh Phdao a village situated in the biggest island along the Mekong River. It is around 45km from Kratie Town. Koh Phdao is a great place for visitors. Koh Phdao has natural delights, rare creatures, local culture and authentic lifestyles collide to form shapes previously unimagined. The visitor can also enjoy the peace full life, tranquility and natural beauty of rural island life or an opportunity to immerse yourself completely in village life. Moreover, bicycle tour to see the other villages around was also popular for every visitor who had been to Koh Phdao before. The tour to Koh Phdao will also enable visitors to see the places along the way for it to such as a Thomas Krae village, Koh Phdao dolphin pool/Kampi dolphin pool, Wat Sarsar Mouy Roy and turtle conservation center. For longer stays in the KohPhdao village, you will be able to involve in the community development project such help family / community to do home garden, school fence, community center, build toilet etc. based on the project activity that available. After visiting Thma Krae village, Sambok Moutain (a mountain of a hill) will be our destination before the dolphin pool. This old age quiet pagoda was known as the great place for people who are seeking for peaceful environment enjoyment and meditation. Your local English guide will guide you to see a last long beautiful painting and its meaning and also visual around the pagoda. Regarding to the next agenda, you will go to Sambou district where you will spot 100 pillars pagoda and turtle conservation center. 100 pillars pagoda is also called Wat Sasar Mouy Roy in Khmer, it is most popular pagoda in this province. Wat Sasar Mouy Roy also has its interesting history around the 13th century and during the pol pot regime. Unlike the other pagodas in Kratie province, 100 pillar pagoda has its own uniqueness. Inside the pagoda, there is a turtle conservation center. The center has established to conserve the Mekong Turtle as it is endangered. Have a short break after visiting the pagoda in a small drink shop in front of it at the riverside where you can see a few islands and sand bar in dry season, there are sugar can and coconut juice await you. Instead of going back to the town, your local English guide and you will jump on a slow local wooden boat from Koh Phdao await to take you to the Koh Phdao village. Boat riding is going to take you sometimes but also give you a chance to see how village life along the river. In Koh Phdao, you will leaded by the community to see their village, visit friendly families, see spirit house of local people which they believe the spirit brings them happiness and understand the development activity of Cambodian Rural Development Team Organization this village. Today you will experience local food that cooked by a group of local women. Moreover, your night time will spend inside the honesty of the local family in a room divided by a curtain, just as local. Pillows, a mosquito net and a blanket prepare for your sleeping night. Next day coming, you will spend this whole day for helping the community or any family in the village to do their work such as harvest rice, plant rice, building a community center, road construction and etc. These works are random and depend on the time of the year. After breakfast the last day, everyone gets on the same boat back to the mainland and get rid on the taxi / minivan back to Kratie town. End of the tour.